Summer is finally here. You can feel the balmy wind around your nose, feeling the sun on your skin and let your ideas run free. It’s an emotional feeling, what nearly everybody loves. The lightness of summer fills our everyday life with happy moments. Noah and I love to swim and catch lightning bugs in the summer. Summer always feels like such a magical time. I love the warm sunshine, balmy nights, and fields and meadows alight with color. That is what Grete Wendt, company founder of Wendt & Kuehn, really loved flowers, especially the simple delicate ones dotting the region’s fields and meadows. She brought flowers from every walk, which she would then lovingly arrange in vases and jugs. She would hand out the flowers among her coworkers to enjoy too. Their favorite flowers were marguerite daisies. The Marguerite Daisies were the inspiration of the first Blossom Child brought into the world in 1929 as article no. 1 of all the Blossom Kinder. Today, Blossom Childs are still an inherent part of the Wendt & Kuehn assortment. Did you know that there are 24 different Blossom Boys and Girls. The dimensions of the flowers may be quite an unique feature. 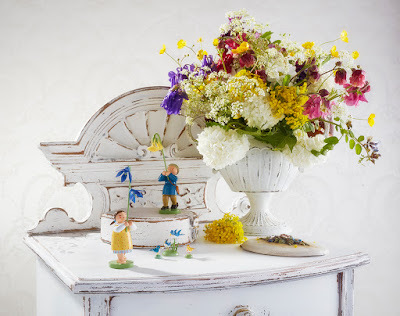 Grete Wendt stylized them into something significant, symbolic: The children aren’t just simply picking the flowers, they’re also giving them away just as Grete loved to do. The joy is written all over their faces! Virtually no other product group so vividly embodies the spirit of Grete Wendt’s life’s work as her Blossom Kinder. Grete Wendt was unpretentious, kindhearted, with a sense of contentment, the carefreeness of childhood, people and nature in harmony. The Blossom Kinder symbolize the pure innocence of childhood, the Blossom Kinder and all their many friends have never ceased to delight enthusiasts and collectors all over the world. Whether as personal good luck charms, cheerful flower-bearing messengers welcoming spring or summer, or as timeless companions through life. They spread the summery flair in your home, which makes you happy. To learn more about the Kinder Blossom please visit the Wendt & Kuehn website. To find a dealer near you please visit the dealer’s page.